"People are rightly concerned about the impact on their health and their children's health," said Carl-Magnus Larsson, Chair, UNSCEAR. "Based on this assessment, however, the Committee does not expect significant changes in future cancer statistics that could be attributed to radiation exposure from the accident," he said. The Committee analyzed reported worker doses and also independently assessed doses for some of the workers. The Committee's assessments are broadly consistent with reported doses, but uncertainties remain for exposures during the early phase of the accident. "The Committee concluded that no discernible increase in cancer or other diseases is expected; however, the most exposed workers will receive regular health checks," said Wolfgang Weiss, Chair of the Assessment. April 1st is the start of Japan's new fiscal year. Fitting, you might say. Residents who were forced to leave their homes in Miyakoji District of Tamura City soon after the start of the nuclear accident on March 11, 2011 are allowed back, as of April 1st, 2014. They are the first in the former no-entry evacuation zone within 20-kilometer radius from Fukushima I Nuclear Power Plant. NBC News in the US has a Reuters article whose only sensationalism is in the title (Miyakoji was never "hot"); otherwise the article simply reports facts, and surprisingly, with numbers for radiation levels, which rarely happens in the articles in the US mainstream media on the Fukushima accident, or any nuclear accident. It is still a joke. Not because the Japanese government is sending the residents back in the "hot zone" (as Reuters' article says, which is misleading) in 3 "short" years, but because the residents in Miyakoji should never have been forced to leave to begin with. The radiation levels in Miyakoji, even though the town is inside the 20-kilometer radius, have generally been much lower than larger cities in the more populous middle-third of Fukushima Prefecture ("Nakadori"), where residents have never been forced to evacuate. It's all because of the unscientific, uninformed decision by the ministers of the Kan administration (PM Naoto Kan, Cabinet Secretary Yukio Edano, Minister of Economy Banri Kaieda) to draw concentric circles around the plant to decide the evacuation zone - as if the nuclear plant accident were an atomic bomb detonation, and as if that had happened on a flat land on a day with no wind. The completion of decontamination work allowed residents of a small part of the Fukushima exclusion zone to return home Tuesday, just over three years after they were forced into exile. The reopening of the Miyakoji area of Tamura, a city inland from the wrecked nuclear station, marks a tiny step for Japan as it attempts to recover from the 2011 disasters. 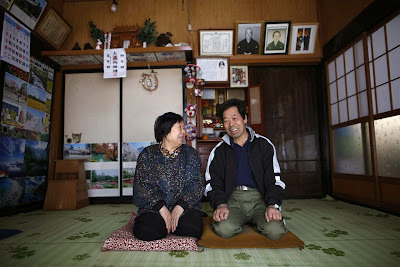 "Many of our friends and neighbors won't come back," said Kimiko Koyama, 69, speaking on her return to the large farmhouse she had occupied for 50 years, while her husband Toshio, 72, tried to fix a television antenna on the roof. A few cars streamed into the town on Tuesday, where several TV news vans were set up. Some elderly women sat by the roadside, but there were no children or families in sight outside. Schools open later this week, but seven children came to the local pre-school and four older children were also dropped off, as volunteers from nuclear plant operator Tokyo Electric Power (Tepco) removed ice and snow and leveled the playground. In Japan, you don't actually hear much about fear of radiation as reason for not returning for these residents. Rather, the concern is not radiation (whose levels are lower than in cities like Fukushima and Koriyama in the middle third), but local economy. As Reuters' article above briefly mentions, the employment in the district depended heavily on TEPCO. But it is not just employment. Residents used to go to neighboring Okuma-machi and Futaba-machi, both of which are inside the 20-kilometer radius evacuation zone and actually heavily contaminated, for shopping, seeing doctors, entertainment, etc. Both Okuma-machi and Futaba-machi are off-limits for years to come. According to the latest measurement by Tamura City, Miyakoji District's radiation level as of March 30, 2014 was 0.14 microgray/hour (more or less the same as 0.14 microsievert/hour). According to the real-time monitoring information compiled at Nuclear Regulation Authority, radiation levels in Koriyama City in the middle-third of Fukushima Prefecture range from 0.09 microsievert/hour to 0.595 microsievert/hour (which happens to be in a nursery school...). The levels in Miyakoji District in Tamura City look to be between 0.1 and 0.2 microsievert/hour. One clarification about the radiation dose of 100 millisieverts mentioned in the article: it is about life-time cumulative dose. The stoppage of all three lines of ALPS was my last post in March, but since then the multi-nuclide removal system has been plagued with new leaks and other problems that cause constant stoppage. The saddest and stupidest of all must be this (or at least it is for me): TEPCO unknowingly contaminated the brand-new 1,000-tonne welded tanks as they kept sending the water treated by ALPS, except ALPS wasn't treating the waste water properly (for reasons not yet clear) and left a significant amount of beta nuclides in the water. TEPCO (or rather, Toshiba) didn't have a way to test the water treated by the three ALPS lines individually. Treated water from the three lines all goes to the same holding tank, from which the water is sent to the storage tanks. Now, someone has to crawl inside the tanks from the inspection holes near the bottom, and scrub the inside clean. TEPCO continued to operate ALPS, the multi-nuclide removal system at Fukushima I Nuclear Power Plant, without noticing the problem. As the result, many tanks were contaminated by highly radioactive materials. 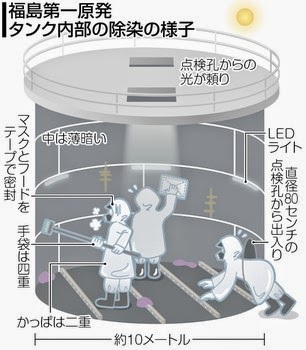 TEPCO says it has started to "decontaminate the tanks", but the ones who do the actual decontamination are the workers. As told by the workers who did the decontamination, it was a hard labor. Workers decontaminated one tank near ALPS which temporarily stores water treated by ALPS. They opened an inspection hole, 80 centimeters in diameter, at the side of the tank near the bottom to enter the tank with 10 meters in diameter and in height. They opened the two inspection hole on the ceiling to let the light. They also carried in the LED lights for the work. Even though the tank had been washed from above with high-pressure washer, until a few days ago it had stored water that contained 10 million becquerels per liter of radioactive materials including radioactive strontium, hundreds of thousands times the limit for discharge. They were beta nuclides so there was less worry for radiation exposure unless they came into direct contact or they were ingested. Workers wore two [water-proof] jackets on top of the protective clothing [Tyvek, probably]. The hoods of the jackets were taped shut onto the full-face masks. They wore four layers of gloves including rubber gloves, and wore long boots. The 30-year old (so-called) researcher at RIKEN, one of the premier research institutions in Japan, who seems to have copied and pasted all the way to her current cushy position, claims her STAP cells are real, and copying and pasting she did to falsify the data was done with good intension - or at least with lack of bad intension. So in her privileged mind, as long as she doesn't mean ill, she should be forgiven. For those who are not familiar, she and her professor during her Harvard days, Professor Charles Vacanti, claim they have created a cell that can become any cell from an adult cell just by stressing it a little bit with acid bath or mechanical stress. One of the photographs critical to their claim and prominently featured and published in the prominent peer-reviewed magazine Nature turns out to be the same photograph from her doctoral dissertation from a totally different process. RIKEN's top management (who happen to be top scientists, too, including a Nobel prize winner in chemistry) held a press conference on April 1st to announce their final findings: The researcher, Ms. Haruko Obokata, knowingly falsified. In her letter, Obokata says the spliced gel lane did nothing to change the study’s results. “There was no merit in falsifying data, and I had no intention of doing so when I made the image. I only wanted to have a better image,” she writes. Use of the duplicated image was also “a simple mistake” made because the images were similar. 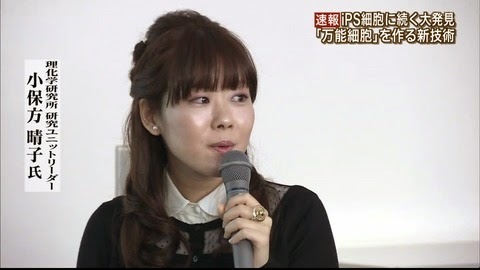 Obokata says that she had already identified the mistakes and sent Nature a correction. Except she didn't identify the mistakes. Net citizens did. Her "simple mistake" involved photoshopping the original image and editing the text beneath the photos. Such an innocent mistake, she actually claims. As long as the intention is good, she should be forgiven, she says. RIKEN says it was presented with only two lab notes in the three years Ms. Obokata was with RIKEN, and the commissioners at the press conference said they were effectively just one note, and so poorly written, without dates, that they couldn't verify the data or the origin of the photos. Ms. Obokata is doubling down, and says she will file a formal complaint with RIKEN, and probably sue them. For what? No one knows. She probably liked the attention she got in her 15 minutes of fame. RIKEN is under heavy criticism for hiring this person who seems like a pathological liar if you read tabloid magazines and for allowing this to happen. She reportedly won the essay contest when she was in middle school by copying and pasting quotes from a very popular animation (Galaxy Express Three-Nine) and passing them as her own words. So far, no one has accused Nature Magazine for its sloppy peer review.